I can’t remember the last time I enjoyed a Salman Khan film so much. Oh yes, it was Dabangg back in 2010 when director Abhinav Kashyap, Salman, Sonu Sood and the rest of the team struck a fine balance between being playful yet not stupid. 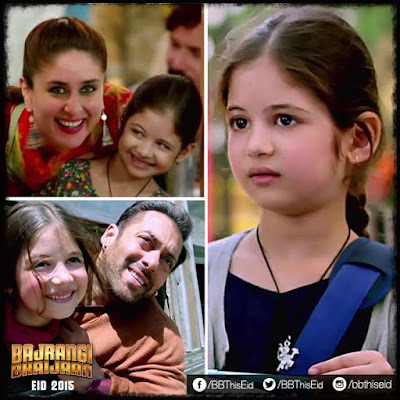 Five years later comes director Kabir Khan’s Bajrangi Bhaijaan (BB) in which an excessively dramatised, play-it-safe finale does not kill its overall impact as a heart-warming entertainer. The story had the potential to be terribly over-done: a six-year-old Pakistani girl called Shahida gets lost in India when she comes visiting Nizamuddin Auliya’s dargah in Delhi with her mother. She chances upon the good-hearted, naïve Hanuman devotee Pavan Kumar Chaturvedi a.k.a. Bajrangi who is constrained in his efforts to help her by the fact that she is mute and too young to write. When he figures out that she is from Pakistan, his attempts to legitimately get her home fail. So he decides to personally transport her across the border and to her family. Now imagine this core concept in the hands of director Anil Sharma who gave us that India-Pakistan screamfest Gadar: Ek Prem Katha starring Sunny Deol in 2001. Better still, don’t pain yourself by imagining that. Thank god instead for Kabir. The director of Kabul Express, New York (my favourite in his filmography) and Ek Tha Tiger, does an unobtrusive balancing act almost throughout BB. This film has none of the hollering or populist demonisation of our neighbour that spoilt the moving love story at the heart of Gadar. Nor does it awkwardly deify all Pakistanis in the interests of superficial political correctness. A thumbs up for that and so much else, Kabir. As with all Salman’s films, BB too gives him the maximum screen time in comparison with his co-stars. As with most of his films, he brazens his way through this one too on the strength of minimal acting skills and oodles of charm. He was cute and likeable in Dabangg, in this film he is completely overshadowed by the supporting cast. Salman has been slow on his feet in films in the past five years, but Kabir has used his star attraction wisely here, giving him only one major song-and-dance sequence to shoulder and no scenes in which he has to race about unrealistically. The list of scene-stealers in BB is led by Harshaali Malhotra playing Shahida a.k.a. Munni. Yet another great job by casting director Mukesh Chhabra. Not only is she incredibly huggable, this tiny debutant can also act. She is sweetness personified but she does not rely on that innate quality to get by, nor does Kabir over-cutesify her as directors of child actors are prone to doing. Kareena Kapoor Khan plays Bajrangi’s supportive girlfriend and Delhi-based teacher Rasika. Though she is present in less than half of BB – and what a crying shame that is! – this fine actress does full justice to her role of a strong and broad-minded woman in trying circumstances. 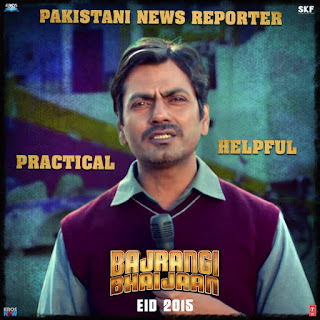 Playing Pakistani TV journalist Chand Nawab, Nawazuddin Siddiqui enters the picture almost one-and-a-half hours into the narrative and walks away with the film. He owns the screen every single time he appears, which is why it is ironic when in that scene in which Chand and Bajrangi finally discover the name of Shahida’s village and Chand breaks into a celebratory dance, the camera zooms into Salman and the kid, cutting Nawaz out for a while. His dialogue delivery, his laughter, a rousing PTC (piece to camera) and that fleeting moment when he leans over to tap a colleague’s shoulder – every second that we see him is evidence of his genius. BB is blessed with other strong supporting actors too, among them Rajesh Sharma as a Pakistani police officer and Om Puri in a brief but memorable role as a Muslim clergyman in Pakistan. 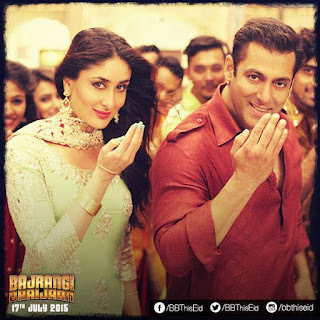 What’s nice about BB is that it doesn’t rest primarily on its hero’s popularity as most Salman films do. V. Vijayendra Prasad’s story is affecting, timely and carefully crafted considering the hyper-sensitivity of elements in both major religious communities portrayed here. 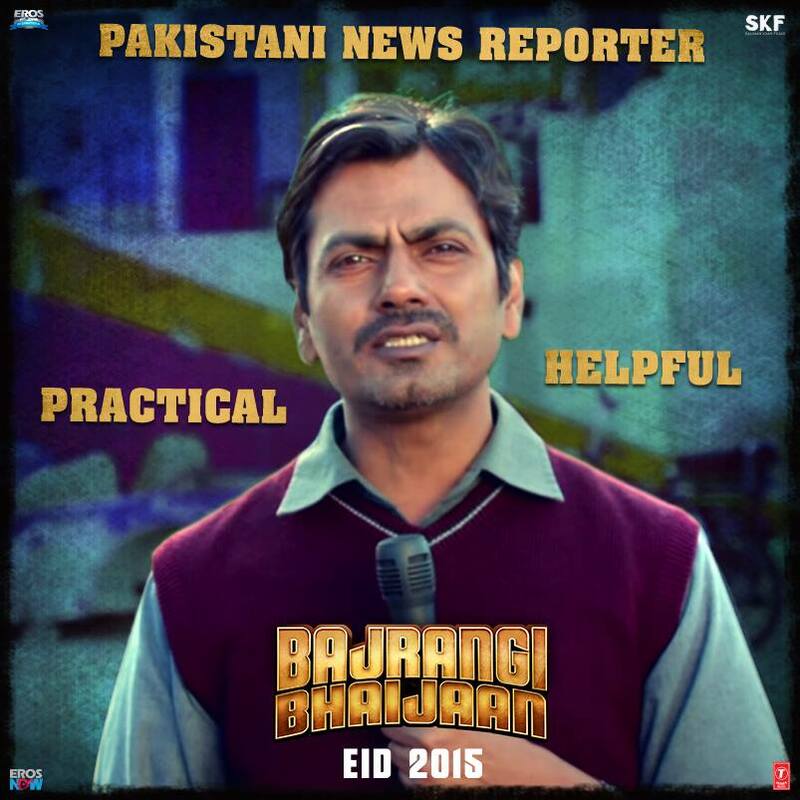 Kabir’s dialogues are for the most part bereft of bombast and intermittently humourous. DoP Aseem Mishra not only delivers extravagant visuals in naturally beautiful settings, but also turns run-of-the-mill canvases into something special. I particularly enjoyed those shots of Munni, Bajrangi and Chand on a bright yellow bed of corn in a mini truck (though I confess I’m not sure corn would be transported without its natural casings in real life). Though Pritam has not created any extraordinary song here, most are enjoyable while they last. Selfie le le re is particularly unmelodious, but all is forgiven in the face of the way Bhar do jholi meri is utilised to take the narrative forward when it is performed in a dargah in Pakistan featuring singer Adnan Sami in a guest appearance. The situation quietly weaves in a message for vegetarians who demand segregation from non-vegetarians. In fact, apart from the overt lesson about India-Pak and Hindu-Muslim amity, what is interesting about BB are the many such neat asides touching upon various issues from media indifference towards positive news to a woman defying patriarchy, all without sermonising. Note, for instance, Rasika’s refreshingly non-DDLJ response to her autocratic father’s ultimatum to Bajrangi to get a house in 6 months if he wants to marry her. That being said, there is much in this film that defies logic, but those flaws are overshadowed by the emotional pull that had me rooting for Shahida, Bajrangi and Chand throughout the second half. I confess though that the over-wrought climax almost ruined it for me, stretched as it was to breaking point, with too much use of slow motion, not a single situational possibility left for after “The End”, and the director’s balancing act between communities becoming strained for the first time. I cannot tell you what happens, of course, but it did make me wonder what we would get if Kabir remade Balu Mahendra’s Moondram Pirai/Sadma with Sridevi and Kamal Haasan. Would he allow Sri’s character to leave without knowing that Kamal is the one who had helped her while she was suffering from amnesia? Come back and read this question after you see the film. Again without giving anything away, I could not help but wonder if under the present dispensation in India, where Hindu fundamentalists hold far greater sway than Muslim fundamentalists, a liberal film maker felt compelled to ensure that if he shows an Indian Hindu making a move towards saying Allah haafiz (Bajrangi never actually utters the words) then he had better pre-empt any offended sentiments by ensuring that this is immediately followed by a Pakistani Muslim screaming out the words Jai Shri Ram – more than once. Perhaps the prevailing negativity in our country has led me to over-think this, but I did wonder about it. It’s a good thing this scene came after I had already dissolved into a puddle of tears as I watched Bajrangi Bhaijaan. My vision of that long-drawn-out climax is clouded by the tears and laughter that preceded it, by the touching transformation of the prejudiced and insular Bajrangi as a result of his encounter with Shahida, and by those two rockstars Harshaali and Nawaz.